After nearly twenty years, I can finally admit it: I’m the one who paid to see “Blues Brothers 2000” in the theater. I know, I know. This was not my finest movie moment, and one I’d rather forget. But in my defence, I didn’t think Dan Aykroyd and John Landis would screw it up so badly. And in 1998, the internet was not filled with movie spoilers like it is today, so I had no idea what I was in for. But once the movies started, I knew right away this was going to be a painful experience. “Blues Brothers 2000” begins with Elwood Blues (Dan Aykroyd) getting out of prison and finding out his brother died years ago. This was the moment the movie lost me. I mean seriously, we’re supposed to believe that NOBODY would tell Elwood his only brother is dead? But things just got worse from here. Just like in the first movie, Elwood wants to get the old band back together. But this time, Sister Mary wants him to mentor Buster (J. Evan Bonifant), a 10-year-old orphan. I feel bad for J. Evan Bonifant because was put in a no win situation. Fans of the original movie were not ready to accepts a Blues Brothers kid. And whoever told him to just act like a grumpy elderly person, didn’t do the kid any favors. The kid eventually bonds with Elwood, and gets his own Blues Brothers suit. Now, I’m no legal expert, but since Elwood doesn’t bring Buster back to the orphanage and then transports him out-of-state, doesn’t that mean that Elwood kidnapped Buster? But who cares about such silly things when it serves the movie plot. Seeking out his old band mates, Elwood goes to a strip joint where he meets Mighty Mack (John Goodman), a bartender who has a good voice and is enlisted as Jake’s replacement when the club is torched by Russians (don’t ask). For what it’s worth, John Goodman is the only one in the movie who looks like he’s having fun. He played Mack with such joy you couldn’t help but like him. Other band members are added along the way, and because every movie needs a villain, the band gets chased by a state trooper (Joe Morton) who is sort of Elwood’s stepbrother. but not really. Not that it matters, because about halfway through the film, Morton has a revelation. He levitates hundreds of feet above the ground, but nobody bats an eye, and he quickly joins the band. Just like the original movie, “Blues Brothers 2000” has plenty of musical numbers. The film has performances by Aretha Franklin (“R.E.S.P.E.C.T.”), Eddie Floyd (“634-5789”), John Popper and Blues Traveler (“Maybe I’m Wrong”), and i haven’t even mentioned the finale which features B.B King, Steve Winwood, Eric Clapton, and Erykah Badu, to name a few. These musical numbers are okay for the most part, but unlike in the original, the performances in “Blues Brothers 2000” feel forced. In the first movie the music moved the story forward, and fit into whatever was happening. But in BB 2000, a scene starts playing out, and all of a sudden everyone breaks into singing and dancing for no reason at all. In hindsight, it was silly of me to expect this movie to match anything in the classic “Blues Brothers.” But with a few changes, this still could have been a decent movie, or at least a watchable one. The talent is there, all they needed was a better story, an R rating, and no Buster. With just a few tweaks, “Blues Brothers 2000” might have had a chance. The following afternoon my friend Matt, (my aunt’s youngest brother) calls me to ask if I’d like to go with him and his friends to the old Quincy theaters to see a movie called “King Ralph.” I think I shouted “yes” before he even finished asking the question. I know I shouldn’t like “King Ralph” as much as I do, but I can’t help it. There’s just something about this comedy that I’ve always enjoyed. Maybe it’s John Goodman’s charm, or the movie’s great supporting cast featuring Peter O’Toole, Camille Coduri, Richard Griffiths, and John Hurt. In “King Ralph” John Goodman plays a Las Vegas lounge singer who becomes the king of England when the entire royal family is electrocuted in a freak accident while posing for a family photograph. Although Goodman is American, he’s the closest blood relative they can find. The rest of the film features Goodman’s Ralph getting into all sorts of shenanigans: Ralph hits a home run with a cricket bat; he sits in the royal bath wearing his crown and scarfing chocolates; he injures a dog while pheasant hunting; and falls asleep during meetings with the British Prime Minister. And then there’s his love of strip joints and Burger King. All the while, those around him try to keep Ralph in line with little luck. Peter O’Toole serves as the King’s private secretary, Sir Cedric Willingham, but even he can only get so far educating Ralph. To many it was probably strange seeing the great Peter O’Toole in a comedy like this, but I look at it this way: the movie needed someone as well established and respected as Peter O’Toole to pull off this role. If the filmmakers had cast Benny Hill in the role, it wouldn’t have worked. Camille Coduri stars as Ralph’s girlfriend Miranda Greene, a failed stripper who is just trying to earn money for her family up north. She also tries to keep Ralph out of trouble, and looks out for him by teaching him British royal history. But this isn’t an easy task with John Hurt starring as the Percival Graves. He pays Miranda a ton of money to be seen with Ralph in the hopes of getting Ralph removed from the throne, so that he can claim the throne himself. And again, just like with Peter O’Toole’s casting, the movie needed someone who would own this role. Only John Hurt could have played Graves with the just the right mix of charm and evil. Does “King Ralph” rank up there with the greatest comedy films of all time? No, of course not. But I saw this movie twice in the theater because I loved the cast, the premise, and because it taught me a little something about how British royalty works. In case you haven’t heard about “Kong: Skull Island,” here is what you need to know: the film is directed by Jordan Vogt-Roberts, and is set in the 1970s. Skull Island takes place after the 2005 Peter Jackson “King Kong” movie that I don’t remember fondly. This time however, the story centers around a group of adventurers and soldiers, led by former SAS Captain James Conrad (Tom Hiddleston), on an expedition to the famed island. Before they ever come face-to-face with the 100-foot King Kong, they run into all kinds of other unexplained beasts while fighting to stay alive and make it off the island in one piece. Warner Bros. will have a very large presence at Comic-Con International in San Diego this year with their DC stuff and other properties, and according to Deadline, Taylor Swift’s latest victim, Tom Hiddleston, will be part of the “Kong: Skull Island” panel. In addition to Marvel’s Studios only decent villain, Hall H will be visited by most of the Kong cast: John Goodman, Brie Larson, John C. Reilly, and Samuel L. Jackson are all expected to show up. I’m really looking forward to “Kong: Skull Island,” even if it’s somewhat related to the Peter Jackson movie. But the cast is better this time (no Jack Black for instance) and if Skull Island clicks with audiences, then we’ll soon see “Godzilla 2” in 2018 (hopefully a better movie than we saw in 2014), and “Godzilla vs Kong” in 2020. And if we’re good boys and girls, maybe we’ll get a trailer for the movie? It’s possible, since “Kong: Skull Island” will be released on March 10, 2017. 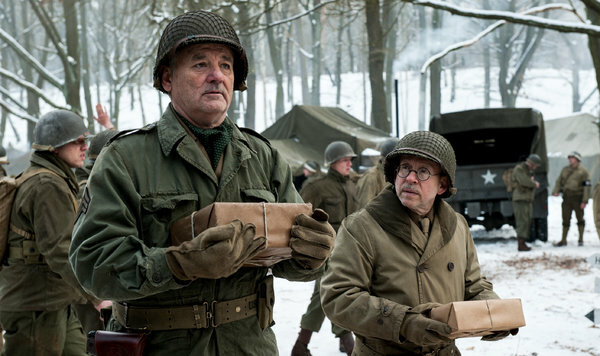 Just after my birthday, thank-you Warner Bros.
Why, “The Monuments Men” of course. George Clooney stars and directs this World War II drama about a small team of Americans searching for art stolen by the Germans towards the end of World War II. 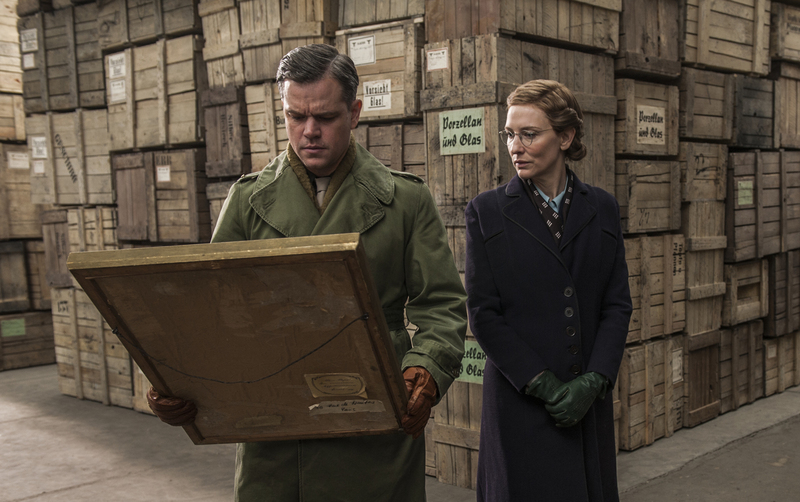 “The Monuments Men” is an old-fashioned World War II movie, the kind Hollywood used to make in the 1950’s when the war was still fresh in people’s minds. Some of those movies became classics, and one of the key’s to their success was with a star-studded cast. 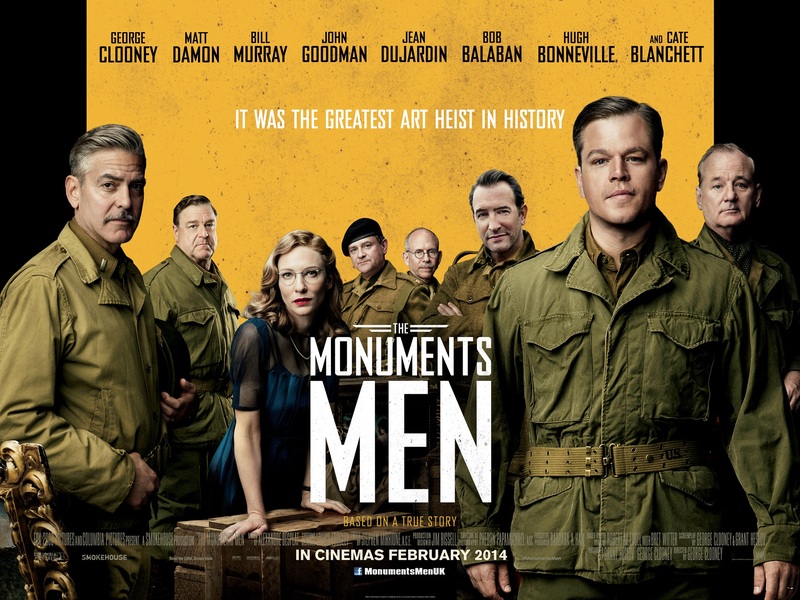 My guess is “The Monuments Men” was in some ways inspired by those 1950’s war films. As the director, George Clooney managed to give this film an appealing retro look. while keeping the overall mood happy yet serious. The movie is very funny at times, but it never lets the viewer forget that the cast is working in an active war zone. The soundtrack is buoyant, and helps move the story along. The music is light when it needs to be, and dramatic where it should be. As good as they were, it was John Goodman and Bill Murray who stole the movie. Some of my favorite moments include Goodman finding out during basic training that he’s being shot at with real bullets, and not blanks. Bill Murray has several brilliant moments, including a trip to a dentist, a John Wayne reference, and a touching Christmas scene. And don’t look past Bob Balaban who plays his character dry as toast. He smiles through jokes and some comedy done at his expense, mostly from Bill Murray. If I have one complaint about the movie, it would be the lighting. I realize the feel and look they were going for, and it works more often than not. However, there were too many scenes which were dimly lit, even when it was daylight. Using this technique in the salt mines, or at night makes sense, but not the rest of the time. 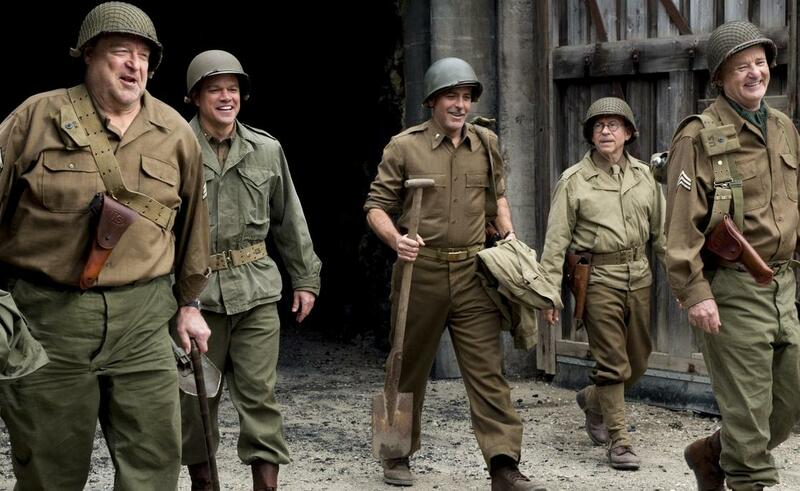 I suppose “The Monuments Men” best quality is that keeps things very real. It often illustrates how hard it was for them to make their case when millions have already died. This becomes quite clear when Clooney and his team land on the beach at Normandy, weeks after D-Day. Their families are always on their minds, but they know their mission is important. What I liked best was how quickly the group became brothers. They saw each other through the good times and the bad. And they always had each other’s back. 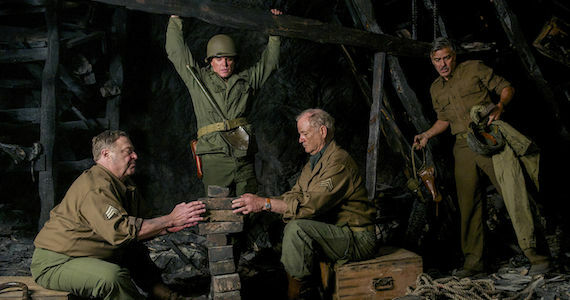 A lot of movie critics haven’t been very kind to “The Monuments Men.” I suggest seeing the movie for yourself because I think those critics missed the point. Some of them were probably expecting this movie would be another “Saving Private Ryan.” Well, it’s not. Nor should it be.